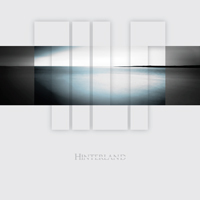 “Hinterland” is the debut album of the UK formation Tilt. Most important musician of Tilt is Steve Vantsis who wrote six of the eight tracks and did also the production of “Hinterland”. The album is mixed by John Mitchell who also plays a guitar solo on the track “Bloodline”. Other big names that helped out are guitar player Robin Boult (Fish) and It Bites keyboard player John Beck. Irvin Duguid - keyboards on track 4 "No Superman"
John Mitchell - guitar solo on track 7 "Bloodline"
The album opens with the track “_Assembly”. You will noticed that the music of Tilt sounds fresh and modern and has in the person of Paul Dourley a great vocalist. Also the use of a lot of keyboard programming is a thing that you will notice. After a slow and brooding opening the track gets more powerful with aggressive electric guitar on a bed of keyboard strings. The band comes up with some nice melodies in this nice opener. Then follows the title track “Hinterland”. The opening is up tempo with heavy and aggressive guitar and drum parts. That is followed by melodic vocal parts. The keyboard programming gives the track some intriguing moments. The guitar work stays aggressive in this powerful track. After all that power “Against The Rain” gives the listener some relief. It is a beautiful and well sung ballad with some great melodies. The next track is called “No Superman”. This is again a powerful track with a lot of aggressive guitars and distorted vocals. The slow “Growing Colder” is more my cup of tea. Beautiful melodies, great vocals and delicate guitar parts. The keyboard strings in the end are very beautiful. “Strontium Burning” is a diverse track with acoustic guitars some great vocal harmonies and a nice electric guitar solo in the end. The album closes with the two long (nine minutes) tracks “Bloodline” and “Disassembly_”. “Bloodline” is one of my favorite tracks. Love the bass line and the diversity of this composition with some great guitar parts and nice vocal lines. The guitar solo is played by John Mitchell. “Bloodline” flows into “Disassembly_” that has an atmospheric and mysterious opening. Slowly the tension of the music and the delicate sung vocals are building up to a kind of climax before it slowly dies out again ... “Disassembly_”. Tilt made with “Hinterland” a refreshing and modern sounding album with some great moments in the vocal and melody divisions. It is a very good debut album and it makes me curious about the development of this newcomer in prog land. A great indicator will be the first gig that already has been booked and confirmed. The band will play in March 2017 at the Dutch Prog festival ProgDreams in the Dutch Prog temple "de Boerderij" in Zoetermeer ... I will be there!